So anyways, what exactly is Jackfruit? Well, its a fruit that is normally found in Asia, Latin America, Africa and India. It is loaded in minerals, vitamins, anti-oxidants, isoflavones and phytonutrients. It is said to help fight cancer and even help with indigestion. But sadly, contains little to no protein, so the protein must be made up in the rest of the meal, such as in the bread and side dishes. You can buy the fruit fresh but I heard its a real pain to peel, so your best bet is to buy it either canned or frozen. I found mine at a local Asian market, if you do not have one near you, I've found several websites that also sells it as well. I've been wanting to try Jackfruit in place of faux meat for a long time. One of the first vegan restaurants I've ever tried, Pureluck, offers jackfruit in place of tofu in many of their dishes. But every time I'd go there, I'd always order the tofu, in fear that the jackfruit wouldn't be as good. Finally last week I worked up enough courage to try their pulled jackfruit BBQ burrito. Surprisingly, it wasn't bad at all and the flavor the jackfruit was so mild that you barely tasted it. If you have ever tried Trader Joe's "Chicken-less BBQ Pulled Chicken," I would say this tasted just like that but homemade and soy free. I sadly do not own a slow cooker or Dutch oven, so I had to cook mine over the stove, covered on low heat. It took about an hour and a half until the jackfruit was ready. So if anyone is like me, cooking it over the stove works as well. I got the recipe from ChowVegan. 1. Drain and rinse the jackfruit several times, trying to remove the brine as much as possible. The smell is really strong, so the more you rinse, the less it will taste like jackfruit. After rinsing, squeeze out as much water as you can. 2. 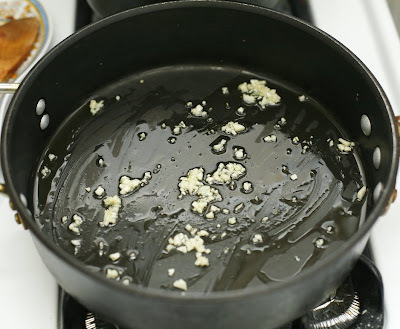 Heat the oil in a pan over medium heat and saute the garlic. 3. Add the jackfruit and season with salt. Cook for a 5 minutes, stirring occasionally. 4. 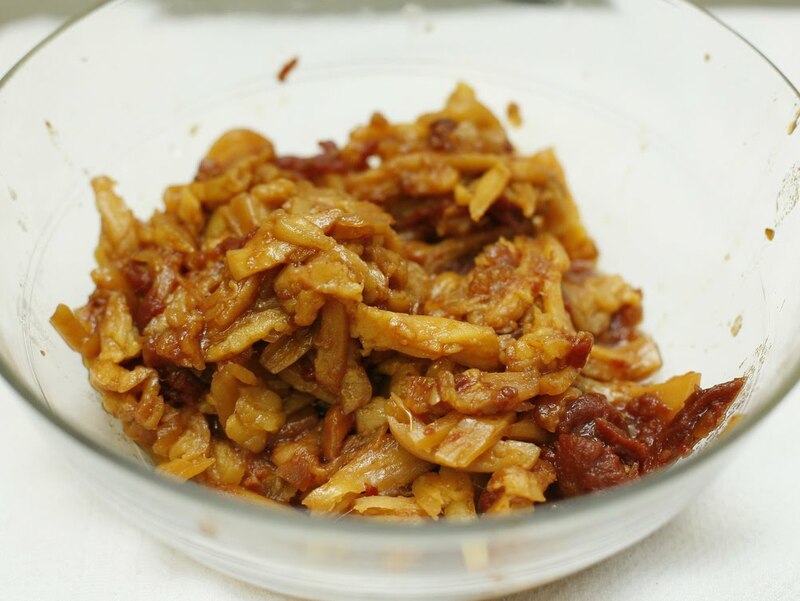 Transfer the jackfruit to a slow cooker with the 1 cup of BBQ sauce and mix well. If you do not have a slow cooker, a dutch oven will work just as well under low heat. 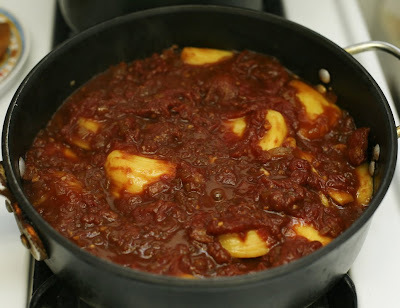 Allow to cook for 1 hour, occasionally stirring and adding more sauce if needed. To check if its ready, pierce the jackfruit with a fork or spoon and see if it breaks apart easily. 5. When cooked fully, remove the jackfruit from the cooker and shred with a fork. Or allow to cool and shred with your hands. 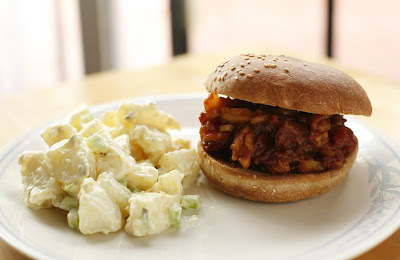 To Serve - Toast your hamburger buns and add one heaping spoonful or more of jackfruit with BBQ sauce. 1. Preheat a saucepan over medium heat. 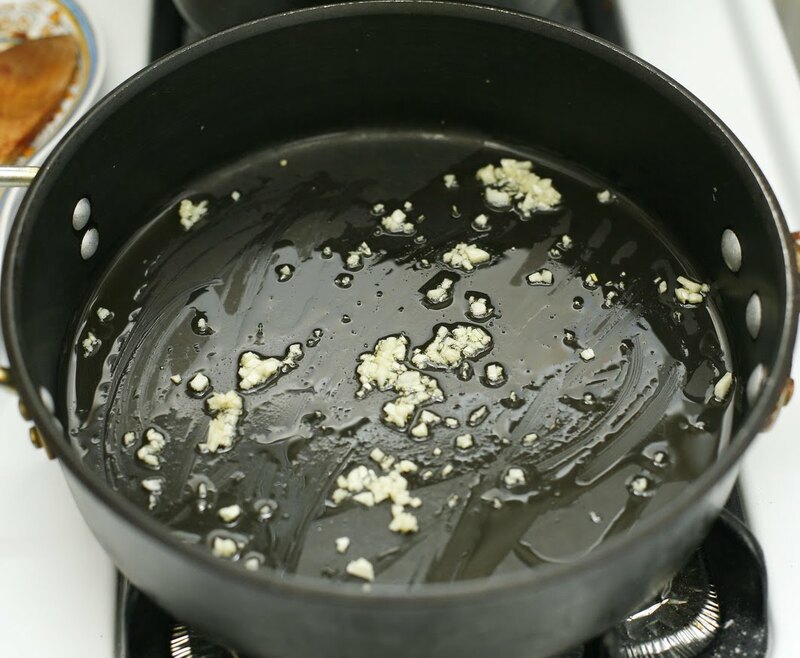 Place the onions in the pan and saute in oil until browned, about 7 minutes. Add the garlic and saute for another minute. 2. 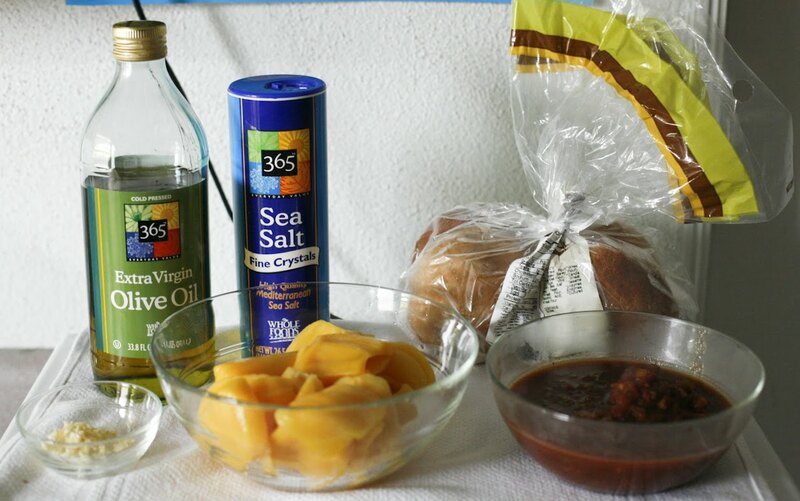 Add all the other ingredients except the mustard and liquid smoke, and cook for at least 30 minutes and up to 1 hour, uncovered, stirring occasionally. Lower the heat if the sauce begins to splatter everywhere. 3. Add the mustard and liquid smoke, and taste for sweetness/sourness. Adjust the flavors if you think it's necessary, and cook for 5 minutes more. If you like a smooth BBQ sauce then puree it, but that's not entirely necessary. I love this idea. I've been thinking that there is too much soy going on here recently so the thought that I can replace it with something slightly healthier is appealing. 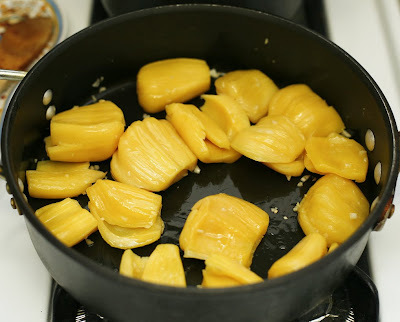 I have never heard of jack fruit so it is about time I start looking for it and give it a try. Exactly Tender Branson! Too much processed foods that we use as 'meat' and if its not that, then we're using beans. This is a really good substitute..too bad about the protein thing though or else it'd be perfect! I tried this once with jack fruit, and it came out a bit goopy; I think I used too much sauce and/or didn't leave the fruit chunky enough...yours looks perfect! I'll have to try it again following your cue. wow Jackfruit...that's one of the very aromatic fruit...the sandwich looks great! Cool that you were able to recreate this at home. And making homemade bbq sauce is the best - I think I'll be looking for some jackfruit, this sounds really interesting. I've yet to try this concept and like it - but this looks really, really great! Yum! I made "pulled jackfruit" before but now I have to try your recipe as well! Very cool that you made this yourself. I've had the jackfruit at Pure Luck, too, and it is awesome! I've never been brave enough to try making it at home, though. You're supposed to buy the kind in brine or water, not the kind in syrup.